Oscar Lorenzo Fernândez (1897-1948) is one of the most important figures of Brazilian nationalistic musical modernism, alongside Heitor Villa-Lobos, Luciano Gallet, and Camargo Guarnieri. The different roles he played reflected his rich personality as well as his involvement with music, as a composer, conductor, pianist, professor, musicologist, and poet. The son of Spanish parents, Fernândez was born in Rio de Janeiro. He began studies in medical school but ultimately did not continue. In 1917, he entered the Instituto Nacional de Música (National Institute of Music) where he studied piano with João Octaviano and Henrique Oswald, theory and composition with Frederico Nascimento, Francisco Braga, and Luciano Gallet, and was also a student of Alberto Nepomuceno. In 1922, Fernândez was awarded three first prizes in a composition competition at the Sociedade de Cultura Musical (Society of Musical Culture). That same year, the Semana de Arte Moderna (Week of Modern Art) took place in São Paulo, and it was a major event celebrating Brazilian modernism in which Fernândez participated. He later engaged in many different projects, such as the creation of the magazine Ilustração Musical (Musical Illustration) in 1930. In 1936, he founded the Conservatório Brasileiro de Música (Brazilian Music Conservatory), an institution that was later recognized by the federal government. 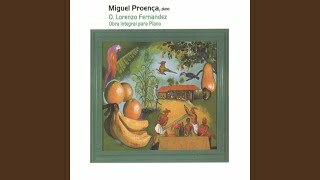 Lorenzo Fernândez wrote symphonies, concertos, songs, an opera, and a ballet, and his works explore a wide range of chamber ensemble types: trio for violin, cello and piano; string quartet; orchestra; wind quintet; trio for flute, clarinet and bassoon; violin and piano; cello and piano; piano duo; clarinet and bassoon. One of his better-known compositions, Batuque (from Reisado do Pastoreio), was performed by such conductors as Toscanini and Stokowski. He also wrote numerous songs for voice and piano, voice and string quartet, voice and chamber orchestra, and choir. The majority of his works, though, is dedicated to piano solo, with a significant production of 33 works (among isolated pieces and collections totalling 82 pieces), from his very first opus, Duas Miniaturas (1918), to his last composition for piano, the three-movement Sonata Breve (1947). His catalog also includes a few works for guitar. However, they are transcriptions of pieces originally written for piano, namely the first Suite Brasileira and only the first movement of the second Suite Brasileira: Ponteio. The first suite dates from 1936 and has three movements: Velha Modinha, Suave Acalanto, and Saudosa Seresta, which are dedicated respectively to Marina Helena (his daughter), Irene (his wife), and Oscar (his son). The guitar version is from 1938 and keeps all three movements, but shows changes in the dedication: the first two (Velha Modinha and Suave Acalanto) here are for Andrés Segovia and the third (Saudosa Seresta) is for Olga Praguer Coelho, a Brazilian singer and guitarist who was Segovia’s wife at that time (incidentally, the guitar and voice version of the Aria from Bachianas Brasileiras No. 5 by Villa-Lobos was done for her). The second Suite Brasileira is from 1937/1938. For the guitar version, Ponteio became a free-standing piece. The transcription dates from 1938, the same year as the others, and the dedicatee was also changed from Lea Braga to the Uruguayan guitarist, Julio Oyanguren. Velha Modinha is a famous piece by Fernândez that has achieved a special place in the guitar repertoire. Nonetheless, his output is so vast and generous, with plenty of potential transcriptions in there, that it offers several other possibilities for the guitar beyond the existing versions. This edition of the Suite Brasileira No. 1 is the first of a series of transcriptions for solo guitar, by Luciano Lima, of Fernândez’s compositions to be published by Les Productions d’OZ. This way, we hope to contribute not only to the guitar repertoire, with the addition of works by this great composer, but also to have his music performed and enjoyed more.